I borrowed the gingersnap crust from my Cutie Pie recipe for this delightfully tangy, creamy, lemon dessert. Only the crust needs to be briefly baked to set, so I still consider this a “no bake” recipe. 9 inch tart pan with removable bottom. Preheat the oven to 350 degrees. Add cookies to bowl of a food processor and pulse until fine crumbs. Transfer cookie crumbs to a medium sized mixing bowl and add brown sugar, flour, melted butter,and salt. Mix well. Press crumb mixture firmly on bottom and up the sides of the pan. Transfer tart pan to a foil lined baking sheet and into the oven. Bake for 8 minutes. Remove from oven and cool on a cooling rack while you prepare the filling. Beat cream cheese at medium speed until fluffy. Gradually beat in sweetened condensed milk. Add lemon juice and vanilla. Pour into cooled crust. Refrigerate at least 3 hours or until set. Once set, spread lemon curd evenly on top. 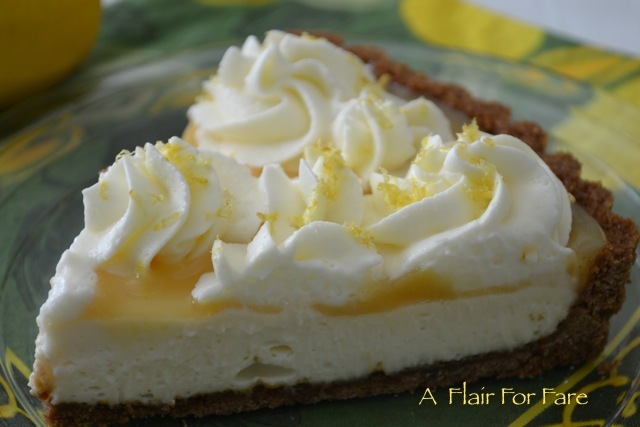 Pipe or cover with fresh whipped cream and additional lemon zest, if desired and return to refrigerator until ready to serve. 1 to 1 and 1/2 cups heavy cream. 2 tablespoons granulated or powdered sugar. To make the whipped topping, chill mixing bowl and whisk attachment in the freezer for 1 hour. You can use a hand mixer or stand mixer. You’ll need 1 to 1- 1/2 cups very cold heavy cream. 1 cup makes about 2 cups whipped cream. If piping the topping I suggest you increase to 1 and 1/2 cups. Avoid ultra pasteurized cream, it is harder to whip and doesn’t hold it’s shape for very long. I suggest using a stabilizer; your topping will hold up longer. Pour cream into chilled mixing bowl. Add sugar and vanilla extract. Start out a slow speed and gradually increase to high as the cream thickens. Slow down when soft peaks form; this will happen quickly- do not over beat or it will lose volume and become butter. 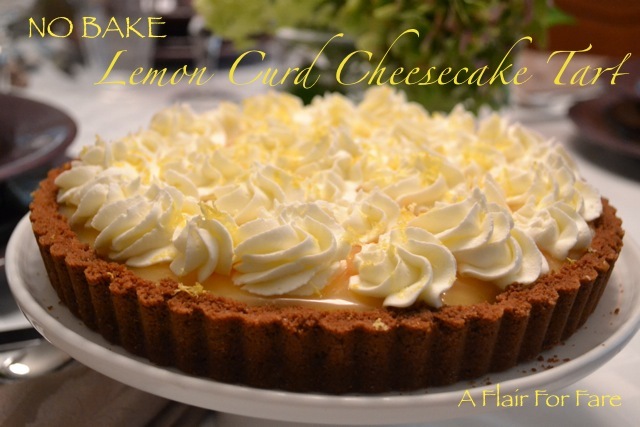 My family loved the Lemon Curd Cheesecake Tart. So easy to make, but looks so professional in the end. Just wanted to mention that the directions for making the crust do not tell you to add the melted butter to the other crust ingredients before pressing into the pan in case you want to edit your post. Thanks for this great recipe! Thank you Nancy for letting me know about the oversight; I have updated the recipe. I’m so glad you enjoyed it!